With emphasis on the "end" part of it. A truly memorable ending. Let me tell the story. We were scheduled for Advanced Gamblers and Advanced Standard on Saturday. On Sunday we were scheduled for Advanced Standard, Advanced Jumpers and Masters Snooker. One of the problems that can occur with running at two class levels is conflicts - needing to be in two different rings at the same time or close to it. When I saw the running order for the classes I predicted conflicts and I was right. That little situation plays a key element in my personal minor drama. Saturday was unremarkable. Decent runs, but a minor glitch or two meant no qualifying scores. Sunday our first run of the day, Advanced standard, turned out to be about 1 pm. Because of the long wait I decided to rev up my dog. This consists simply of getting her excited about running. Oops - I over did it and we went a bit wild. I'd guess we managed to collect 30 or 40 faults on the first half of the run - the second half she settled down and worked beautifully. They set up the Advanced jumpers ring but since the judge was busy in the other ring we knew it was going to be a couple hours. Meanwhile the Masters ring was progressing rapidly toward Master Snooker, in which we were also entered. I was not surprised when the two events ended up starting at roughly the same time. I notified each ring steward of the conflict. The Masters Snooker ring didn't want to wait for us. The Advanced Jumpers gate steward was a newbie and uncertain how to deal with conflicts. I kept pacing back and forth between the two rings hoping that one would get clearly ahead of the other. 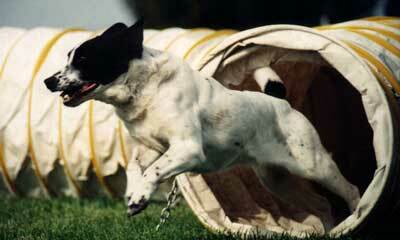 Tanith was the last dog scheduled in Masters Snooker and second to last in Advanced Jumpers. Advanced jumpers was slightly ahead of Master's Snooker, so I decided to count on getting that one done first. 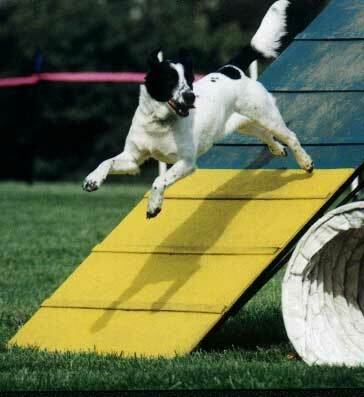 The dog before me got to the line while the ring crew reset jumps. Over at the Master's Snooker ring they still had about four dogs ahead of us. Except that back at the jumpers ring the crew was having a problem with one of the jumps. They finally got it fixed and the dog ahead of us ran. I went ahead and got on the start line. I noticed they forgot to rest the jumps to Tanith's jump height, so I called it to their attention. As they are resetting jumps I noticed the person who was supposed to be ahead of us on Master's Snooker was running that course. I paid attention to the course I was on and ran. We completed the course with a clean run. Course time for performance was 48 seconds, we did it in 40.98! So I gave Tanith a treat and jogged over to the Master's Snooker ring gasping for breath. I spent 30 seconds catching my breath while everyone was clearly eager to get out there and take the course apart to they can get ready to go home. I got on line - Tanith was eager to go - but I DID get a wait at the start. Cool. Now, Snooker is a complicated game, and if you don't know it maybe the story won't make sense. It is a game a strategy. 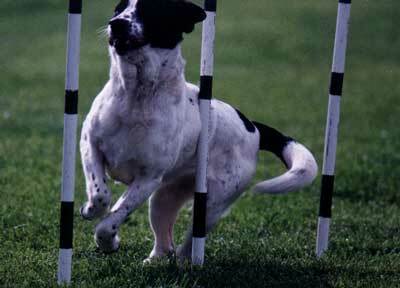 There are three "red" jumps and a number of other obstacles labled with point values 2, 3, 4, 5, 6, and 7. The idea is to riccochet across the course trying earn points. You have to jump a 'red" to get the right to try the other obstacles. When you have done each red once and only once then the you have to take the 2, 3, 4, 5, 6, & 7 in that order. The object is to get the highest number of points that you can - but the high point obstacles are either difficult or awkwardly placed. The course intentionally does not flow. To get the most points you have to take your dog past other tempting obstacles. If you collect the highest possible number of points it would be 51 - you need only 37 to "qualify." 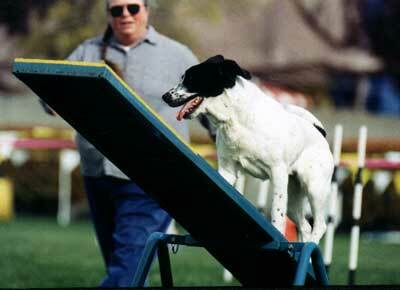 Each person figures out what will work for their dog - sometimes taking lower point obstacles is wise. For this course the number 7 obstacle was an A-frame + tunnel combo. Tanith loves the A-frame. So I decided to go for the gold - 3 #7s. Ok, now remember, I'm standing out there on course with my breathing just barely returned to normal. The timer gives me the signal and we take off. I call Tanith over the jump run out to #7 complete it, turn her out to the 2nd red jump - perfect (very oblique angle thank-you Tanith!) and head out for #7. Just as Tanith clearly jumps OVER the down contact zone on the A-frame the timer blows the whistle - the clock had malfunctioned! The judge says "Looks like you get another chance at that contact" So we go back to the start. Tanith thinks we are done and wants to go visiting, but I get her attention, get my huffing and puffing under control and off we go again. Jump run out to #7 . . .
run out to jump, spin back to #7 GOT the contact! out the tunnel . . .
*Tanith* had other ideas. She took the A-frame . . .
MAN am I out of breath! run for 2 ... 3 ... 4 OOPS ALMOST got lost ... 5 start for 6 and *bweep* the out of time whistle blows - I'm dying but we did it. With 3 7s in the opening we didn't need 6 & 7 to qualify! So we turned a certain Non-Qualifying run into a Qualifying run thanks to a malfuntioning clock! I was so tired I could barely see - but Tanith got her treats! Now that is an awesome way to end a week-end. 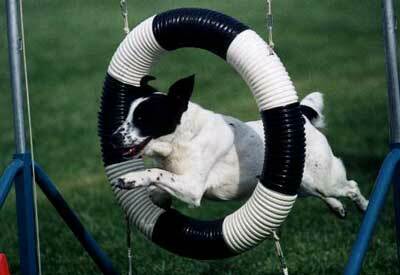 Saturday was all weather agility. Gale force winds, sun shine, clouds, driving rain, hail then sun and calm followed by more wind, and clouds. Still, Bill Newcomb and Tien Tran managed to get some nice pictures. Sunday was very nice weather. We even got a 5 point leg in Standard Veteran's Elite. It could have been 10 points but I made a mistake and started to send her off course. When I called her back the look she gave me had me laughing the rest of the way. So I was over time by a bit more than 3 seconds. It's very hard to run and laugh at the same time. We had all kinds of weather today. A steady wind of gale force for most of the morning with the sun playing hide and seek, sometimes between billowing white clouds, and sometimes smothered by blankets of grey ones. In the afternoon we got treated to a driving rain, interrupted by a hail storm, making way for another round of sun, some relief from the wind, followed by yet another driving rainstorm which shortly thereafter gave way to resuming the wind with (sun/clouds). My morning started with my car trunk refusing to open. Naturally all my gear is in there. Sometimes if something shifts to just the wrong place this happens. (This is, I think, the fifth time). Only thing to do is hook the crate, open the back seats and pull everything out of the trunk. Well, mostly everything. Those of you who have seen my trunk know that makes for quite a pile. Obviously NOT something I had time to do before my first run. So I used a pole to fish out the dog treats, my lunch and my trial bag. First run was, unfortunately, Standard. Tanith was enjoying herself, but not paying attention and I ran out of steam before the end of the course. I like Gamblers to come first so Tanith can play the wild dog. Round two of Standard was better. Except that I wasn't paying attention and I sent my dog off course. It was a complicated course. Best thing about our run is that we had TWO tunnel-not-aframe approaches and Tanith took the tunnel on both. That little set up was in the middle of the course like this - jump, tunnel, jump, go around, tunnel, jump, go around, A-frame, jump OUT to weave poles. It looked like a USDAA course stuck in the middle of a NADAC course. It was supposed to be a NADAC course. I LIKE USDAA but I didn't really like the course. It wasn't terribly difficult when you really looked at it, but I thought it lacked balance, and for a NADAC course lacked flow. That lack of flow makes it really tough given NADAC's tighter course times. Gamblers was fun, if only because I thought to ask if the gamble obstacles could be used in the opening. 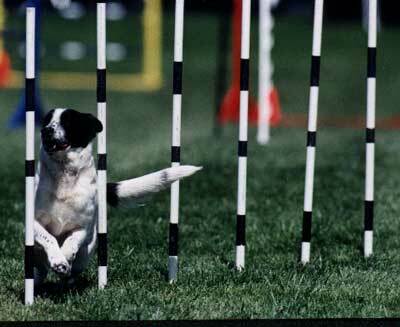 Most of the judges have been lately claiming "new rules" mean you can't use gamble obstacles to gather points. I suppose everyone just took it for granted. Anyway - not only could you use them, but you could do anything EXCEPT take them in order. Well on the point accumulation scheme this was mana from heaven. The number one obstacle was a straight tunnel parallel to the number three teeter. 16 points zip zip. One of the other elite competitors missed briefing. When she commented on people "practicing" the gamble I explained. She bounced out of her chair went down and took a look and completely revised her running strategy (worked too). Some competitors used ALL the gamble obstacles, some multiple times, for full points just by avoiding being in numerical order. Although I usually avoid weaves in gamblers due to lack of speed I really wanted to take advantage of the teeter, so we came at it from a round about way weaves, jump, tire, weaves, teeter, tunnel, teeter, tunnel OUT jump, A-frame, jump whistle tunnel ooops blow the gamble. Total 36 points. Samantha, the kid who was going to run Tanith in jumpers, didn't show up. Her father was there. Apparently Mom didn't want her going to agility on Easter, and it's much too long a drive for one day. Dad ran all three dogs. I made the mistake of asking another kid to do it. Mary likely has the technical skills and she did a decent job of getting Tanith's attention with food away from me, but Mary is kind of um um understated. When they got on course Tanith started to come over to me Mary just called her is a soft voice and looked helpless as Tanith came over. I said "squeak" She says "What?" 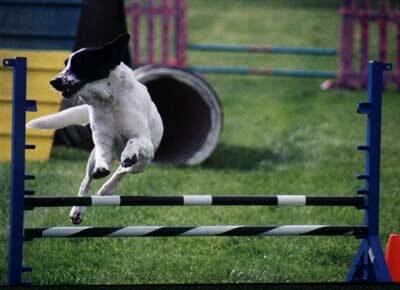 and when she understood "I don't squeak" *Sigh* one jump. Which may or may not have happened with Samantha, but Sam knows how to use her voice. Personally, I think on that particular course there was a chance Sam might have actually done it. As it is, however, it is not an experiment I'm eager to try again. Maybe with Sam. But I will need to be very careful. Tanith thought I was mad at her. She wasn't just hungering for Mom. In order to not give her positive feedback for racing over to me I was turning my back on her. Well, that worked. But Mary didn't squeak and coo over her, just fed her. That was enough to get Tanith to go back to her, but not enough to make her happy about it. *sigh* Oh well, I knew it was a risk. And I think it's worth pursuing if I can make sure she is doing it with someone who will make it FUN. And no it's not Mary's fault either - the dogs she runs DO have fun, it's just a different style. When talking it over later with someone else we also agreed that I had made another mistake in choosing my substitute. She was too old. No offense to her but one of the reasons I chose Sam in the first place is because Tanith likes kids and humors them. She will do stuff for kids she won't do for me. Ah well.